Start your day and end your day by making contact with the Divine Essence. Remember God in everything you do. Stay in the universal flow. Each of the five contacts takes less than 15 seconds. Are you ready to give 15 seconds of your time to make a contact with Divine Essence? Recite five prayers, at intervals throughout the day, and tune in with Beauty, Goodness, Righteousness, Joy, and Freedom. There is a natural rhythm in the Universe. 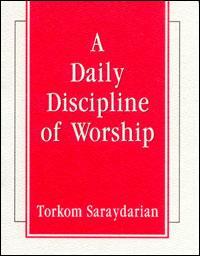 The Daily Discipline of Worship gives you easy and simple ways to tune into that rhythm. Start the day with a prayer to invoke Beauty. UPC # 9780911794526 At 9 am, invoke Goodness. At Noon, invoke Righteousness. At Sunset, invoke Joy. Before you sleep, invoke the protection of Divine Freedom. An easy and inspiring way to start your daily contact with your Higher Self! Learn how to pray! Experience the power of pure, evocative prayer. Keep a copy of this booklet in your pocket, in your car, in your desk and next to your computer. Take a 15 second break and say a prayer. You will see a new change in your life. Highly recommended for gift giving; excellent introductory materials on the Teaching. Pages: 28 We also recommend Prayers, Mantrams, and Invocations for a great selection of prayers for your use at any time and for any purpose.